How GLUTEN may be wrecking your health – and what you can do about it! Unexplained Infertility and Miscarriage! What’s The Best Approach? I was motivated to comment on this article on infertility because not a mention was made of how gluten can affect infertility, sterility, miscarriage, and a poor outcome in pregnancy: http://www.medscape.com/viewarticle/866729?src=wnl_edit_tpal&uac=156633BG “Evidence-based approach to unexplained infertility: a systematic review.” Gunn DD, Bates GW. The chapter goes on to discuss many other pregnancy, women’s, and men’s issues that for the most part are being neglected by mainstream medicine. The research is there, but in many cases begs for much more. It is criminal that more attention isn’t paid to the numerous and devastating effects of gluten. Gluten is taking a huge and costly toll on our population, especially our young folks. Are you having trouble conceiving or maintaining a healthy pregnancy? If so, please do not ignore gluten. When all is said and done, I wonder how many OB/GYNs or infertility specialists might think to test their infertile or problematic pregnancy patients for celiac disease or gluten intolerance? Has your doctor suggested testing (4 blood tests) for gluten issues? If not you may need to become your own advocate. Nobody really wants to know if they are gluten intolerant or have celiac disease, but gluten is affecting a huge part of our population, maybe as high as about 1/3. Many folks are in sheer denial and keep their heads buried in sand at a cost to their own health or the health of their children. Discovering gluten issues and following an absolute GF lifestyle may just lead to a healthy pregnancy, not to mention a healthy life. 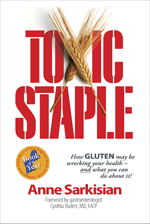 Toxic Staple, in Chapters 16 and 17, explains blood and specialized, very sensitive, cutting-edge stool testing your doctor may not be up on (not a lab or hospital stool test). Do not expect to get enough testing to detect a problem by just asking your doctor to test you. Too many folks are not given enough testing or they test false negative on the one test offered and are told they do not have a gluten issue. Very important: you need to keep eating gluten until you have the blood tests. Do not jump for joy if negative on the blood tests (as were most of my own family). It is crucial you follow through with stool testing (Chapter 17). Please send your gluten-free success story via contact info above to share as an anonymous testimonial to the benefits of living GF. * Martinelli, P., R. Troncone, F. Paparo, P. Torre, E. Trapanese, C. Fasano, A. Lamberti, G. Budillon, G. Nardone, and L. Greco. “Coeliac Disease and Unfavourable Outcome of Pregnancy.” Gut 46, no. 3 (2000): 332–35. Available in Kindle, Nook, iBook, and Kobo formats! “Full of Doubt” about Gluten?